Primary colours cannot be produced by the mixing of other colours. RED is not a primary colour, it is made from a mixture of MAGENTA and YELLOW. The third Primary colour in pigment is CYAN (Pthalocyanine Blue). There have been many colour theories and models over the centuries, offering a wide variety of ideas about colour – dealing with light, pigments, harmony and complementary colours; often limited by the colour technology available at the time. 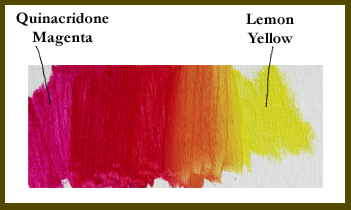 Such a range of ideas has resulted in the confusion in the current age concerning the Primary Colours in pigment, and their true Complementaries. In this age of computers and printers, people are becoming increasingly aware that the three primary pigment colours are not Red, Yellow, and Blue as many of the colour theorists of the past taught, but Magenta, Yellow, and Cyan. This places Red, Ultramarine Blue, and Green into the position of secondary colours (produced when two primaries are mixed together). The Three Primary colours of Pigment are the opposite of the Three Primaries of Light. 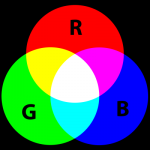 A reversal occurs when dealing with light rather than pigment – Red, Blue, and Green become the three primary colours, and Magenta, Yellow and Cyan are the secondaries (hence the RGB values placed on images to be displayed on a TV/computer screen – screens deal with light or additive colour: pigment deals with subtractive colour). James Clerk Maxwell is credited as being the father of additive colour. Another common use of additive light is the projected light used in theatrical lighting, in nightclubs etc. Note how the three Primaries of light combine to create white: in pigments, the three Primaries combine to produce black. Mr. Hatt produced an accurate colour wheel back in 1908 but much inaccurate colour theory has been taught in schools across the world since that time. One reason may be that so many colour theory models have been put forth over the years, Mr. Hatt’s model may have been viewed as one possibility among many. 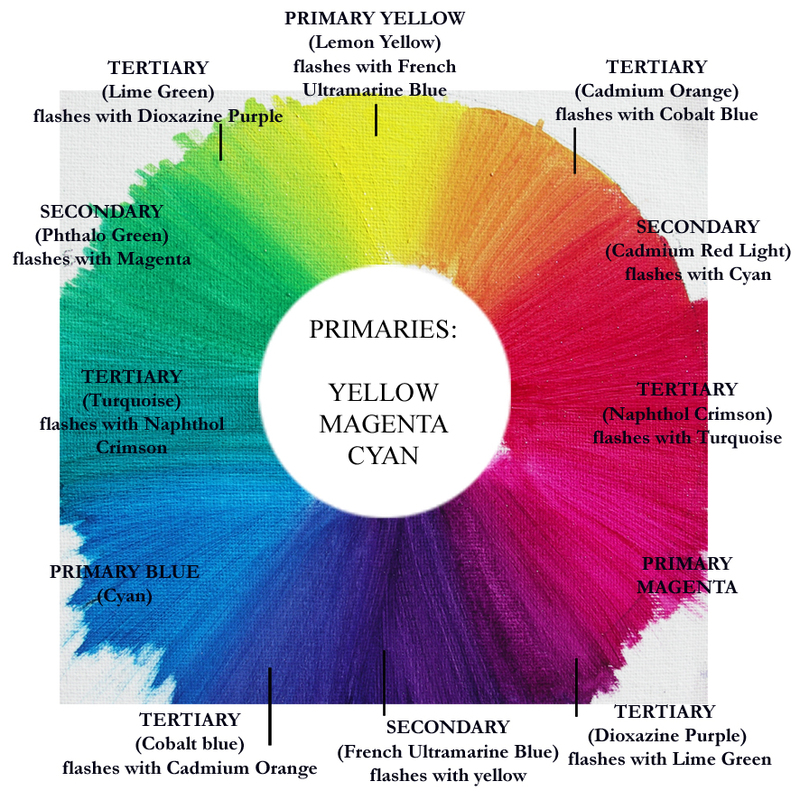 Another reason could well be hinted at in the words quoted above – magenta and cyan pigments were not available in a non-fugitive (non-fading) form until times still ahead of some theorists, i.e. although the colours could be made, they would fade when exposed to sunlight. Even then, a fugitive magenta was not available until 1859, and the Quinacridone Magenta used today was not available until the 1970s! This brings even greater credit to the vision and work of Mr. J. Arthur Hatt. It becomes easier to see why so many colour theories were put forth, when we consider the pigments which were actually available during the period in history that the theorists lived. Some interesting colour discoveries are listed below, along with a selection of colour theories, in order that the student of colour may see just how diverse this seemingly simple subject has been over the centuries. I am deeply indebted to Mr. Don Jusko, Maui, Hawaii, artist and colour theorist of our modern era, for information on his website www.realcolorwheel.com regarding colour discoveries and theories throughout the ages, from which we have quoted and added to below. 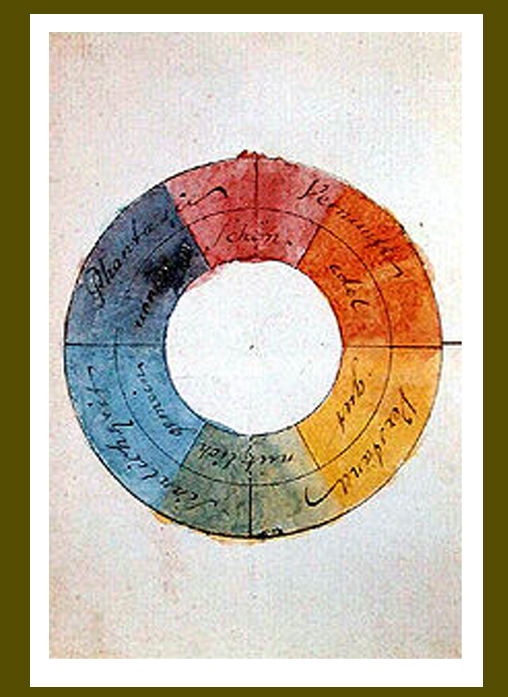 His own version of the colour wheel is displayed, designed so as to provide extra information regarding how colours darken to black, which also matches the way elements, which make crystals, get darker. 1935 Cyan Blue (Pathalocyanine) is discovered, the true primary. 1970s Liquitex make a perfect transparent magenta, called “Acra Violet”. Nowadays, the correct name is Quinacridone Magenta, PR:122. 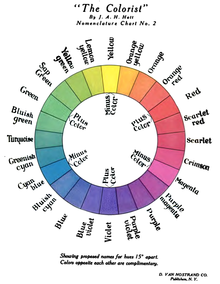 1666 Isaac Newton (Opticks) devised the first colour wheel, with seven segments of the light spectrum (in which magenta does not show up), based on the observation that a prism splits white light into the colours of the visible spectrum. 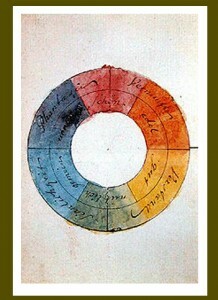 1708 Traite de la Peinture in Mignature, attributed to Claude Boutet, included the oldest example of the symmetrical 12-hue artists colour wheel, using RED, YELLOW and BLUE as primaries. 1809:Zur Farbenlehre [Theory of Colours] Johann Wolfgang von Goethe’s double intersecting triangle depicts a 6 segment colour wheel with no magenta or cyan. 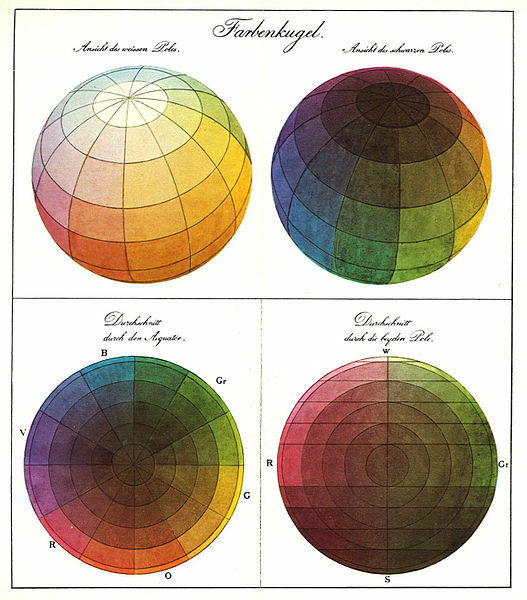 1839 The Law of Simultaneous Color Contrast by Chevreul: a 12 segment RYB colour wheel, placing Ultramarine blue/Orange; Yellow/Purple; Red/Green. 1862 Japanese Colour Wheel: 5 colours, White, Black, Yellow, Red, Ultramarine Blue. 1879 Ogden Rood makes a double colour cone model with white on top, black on the bottom, RED, GREEN, BLUE as primaries. No magenta or cyan. 1905 Albert Munsell creates a 5 segment colour wheel, i.e. no Primary Triad. Red, Green, Yellow, Blue, Purple. 1908 J.A. 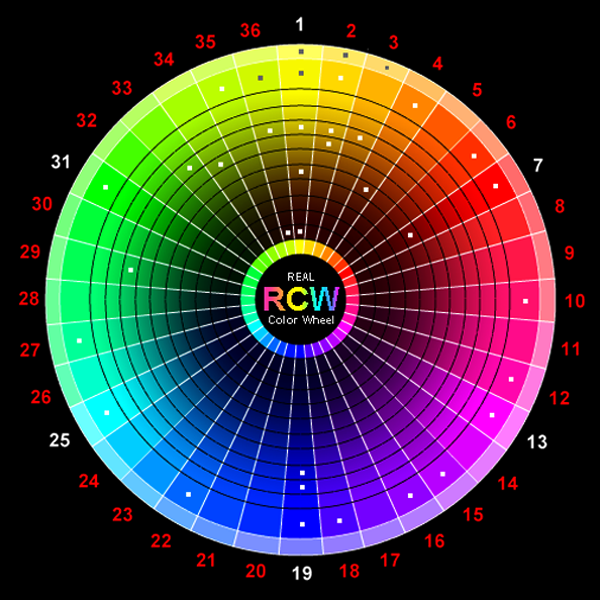 Hatt “The Colorist” publishes an accurate 24 segment colour wheel for pigment and light – some colour names have since changed, but the colours themselves are correctly positioned. 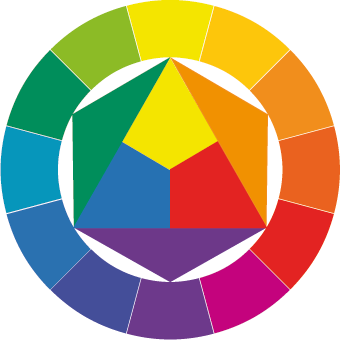 1919 Die Farbenfibel (Color Primer) by Wilhelm Ostwald Die Farbenfibel depicts a 24 segment colour wheel. Red, Yellow, Blue, Sea-Green in the quarters. 1961 Johannes Itten Farbkreis shows RED, YELLOW and BLUE as primaries. 1996 Don Jusko Original Real Color Wheel. This transparent 3 primary colour wheel joins together the colors of Light, Crystals and Pigments. Primaries: MAGENTA, YELLOW and CYAN.